Now that I’ve got some shared storage setup for the lab environment, it’s time to get some ESXi 5.1 hosts. Since this is a lab environment, I want to run some nested ESXi 5.1 hosts. Running nested means installing a hypervisor inside of another hypervisor. This could be XenServer, Hyper-V, or ESXi. Obviously, I recommend the later! You can install and run VMs on top of the nested ESXI install, and they can be 64bit, but that depends on the CPU. I had already blogged about running a nested setuppreviously, however, there are enough changes from 5.0 to 5.1 to merit a new post and instructions. 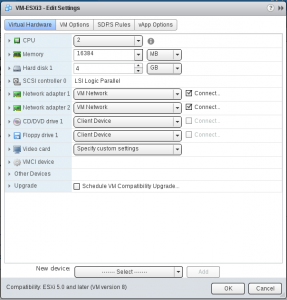 For our Nested ESXi server, we will need to make sure that it is hardware version 9. When I created a VM with the Windows client, it was version 8, and I had to upgrade the VM hardware; however, with the web client, the default was hardware version 9. If you are version 8, simply edit the VMsettings, and choose to schedule VM compatability upgrade, and choose “compatable with ESX 5.1 and later”. At this point, we need to enable VT and EPT (or AMD-V and RVI) support on our new VM. Your CPU may or may not support this. In fact, ESXi 5.1 is more strict! In ESXi5, you could run 64bit Windows on a nested ESXi box, even if you didn’t have the proper support for EPT or AMD RVI. In 5.1, you are required to have a CPU that supports EPT or AMD RVI. To check, browse to https://your-esxi-ip-here/mob/?moid=ha-host&doPath=capability and look for NestedHVSupported. If it is false, fear not – you can still run 32bit windows on your nested ESXi hosts. 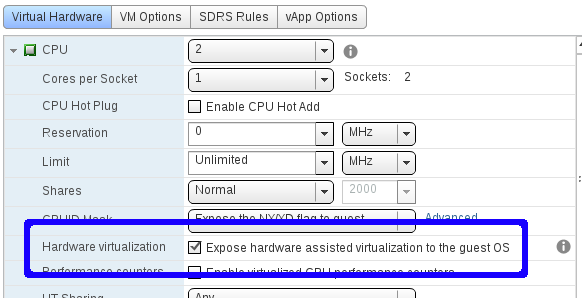 Finally, we need to enable Promiscious Mode on our vSwitch, just like in our Nested ESXi 5.0 environment. We need to make sure the networking is setup properly. On each host, for your VM Network, enable promiscuous mode for the port group. That’s it! 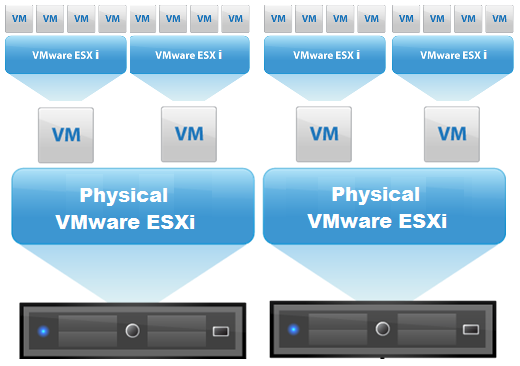 Simply mount your ESXi ISO, and install inside the VM.